← My grandfather passes away. I happened to be driving past City Hall a few minutes ago and caught sight of the MV-1 manufactured by Vehicle Production Group. I was able to speak with John Gaydash a former GM executive. Given its pricing and options, the vehicle is intended to compete directly with ramp (disabled) taxi vans, not regular cabs. Understandably, John et al. are hitting up City Halls across the country to get their regulatory foot in the door. If they can get municipalities to code this as standard disable cab equipment they’re looking at some real cash. This will be the only built-for-purpose taxicab in the North American market. Thanks John and the VPG crew for stopping by SF! Click here for the full flickr photo set. 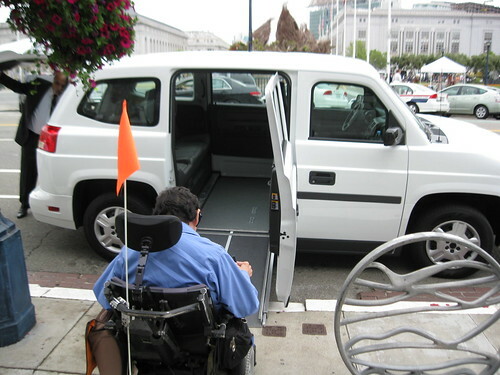 This entry was posted in Uncategorized and tagged automobile, automotive industry, built-for-purpose, cabbie, city hall, disability, disable, general motors, gm, mv-1, ramp, ramp cab, ramp taxi, san francisco, sf, standard taxi, taxi, taxicab, vehicle, vpg. Bookmark the permalink. I just stumbled across your blog. It looks good. I think I your format better than mine. This article is excellent. My blog is almost all political at the moment.